commercial and fine art. He currently resides in Ottawa. In 1953, he came to Canada and settled in Toronto where he attended Ryerson College. He worked at a commercial printing plant and produced a series of commercial and fine art commissions. 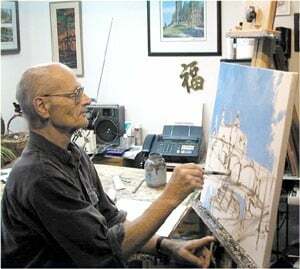 Over the years, he has produced well over 2,000 original watercolors, acrylics and oil paintings which have been sold all over the world through art galleries and private commissions. Many of his paintings have been reproduced in limited an unlimited editions totaling more than 750,000 reproductions. He worked at The Ottawa Citizen for 30 years in advertising, marketing and public relations. With the help of The Ottawa Citizen, he has raised more than two million dollars for a vast number of charities through the sales of his books, calendars, art and reproductions. After retiring from The Citizen in 1993, Ben Babelowsky continues to paint the spectacular rural and urban scenery of Eastern Canada, the USA and the Maritimes. He also continues to donate art to many charities.